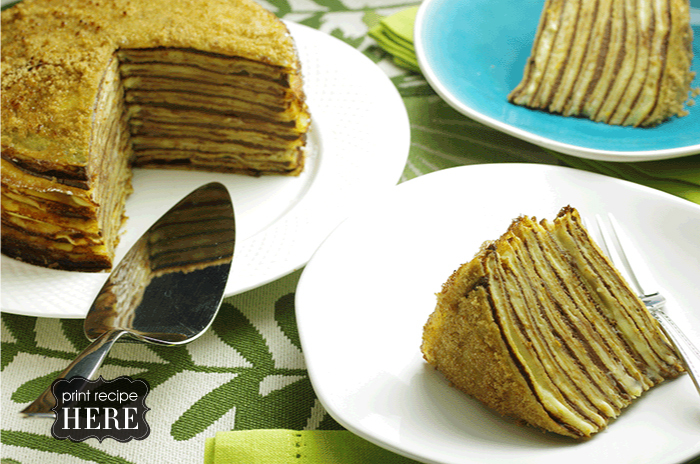 Instead of wrapping your crepes around a filling, you can stack the crepes, layering them with some filing, and make a cake that’s unfailingly impressive. 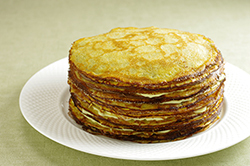 Traditionally a crepe cake is made with about 20 crepes (so you’ll need to double the crepe recipe) and layered with vanilla pastry cream. 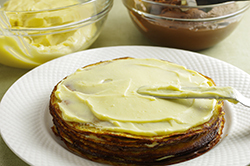 You can use chocolate pastry cream or the same lemon curd used for the Suzette-type crepes, or you can alternate layers of pastry cream and curd on half the crepes and jam on the others. 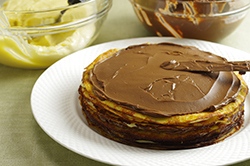 You can layer the crepes with bittersweet ganache or ganache and Nutella. Whatever you do, you should assemble the gâteau in advance so that you can give it at least 4 hours in the refrigerator before serving. To finish the cake in style, sprinkle the top of the (cold) gâteau with an even coating of brown sugar and use a blowtorch to caramelize the sugar. Wait for the sugar to cool before you bring the cake out to applause. 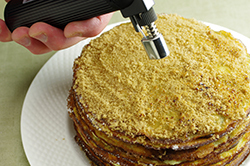 If you don’t have a torch, just dust the top of the gâteau with confectioners’ sugar. 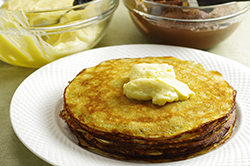 Be Prepared: Crepe batter is very quick to make, but it absolutely must rest in the refrigerator before you use it – it needs the rest and chill to become perfectly blended and to thicken. Two hours is the minimum; 12 hours or more is ideal. When you’re ready to make the crepes, sprinkle a dinner plate with sugar, and keep the sugar bowl close by. Check the batter: it should be just a bit thicker than heavy cream. If it seems a little too thick – it should pour easily – thin it with milk, stirring it in a drop at a time. 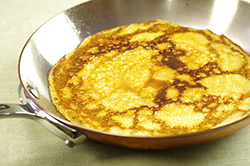 To make the crepes, you’ll need a seasoned or nonstick 7-1/2-inch-diameter crepe pan or a similar-sized skillet. 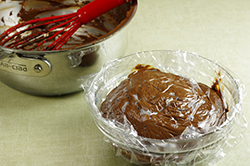 Rub the pan with a lightly oiled crumpled paper towel and put the pan over medium heat. 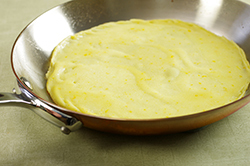 When it’s hot, lift it from the heat and pour in 2 to 3 tablespoons of batter; as soon as the batter is in the pan, swirl the pan to spread the batter in a thin, even layer. If you’re new at this, the easiest thing is to pour in more batter then you need, quickly swirl the pan, and then pour the excess batter back into the pitcher. 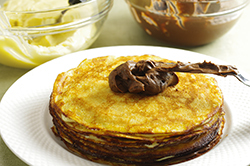 Return the pan to the heat – use a small spatula to cut off the tail that formed if you poured back the batter – and cook until the top of the crepe is set. 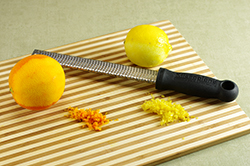 Run the spatula – an offset icing spatula is great for crepe making – around the edges of the crepe and take a look at the underside: if it’s browned, flip it over, a job best done with your fingers. Cook until the underside is speckled with brown spots (t will never be as brown or a s pretty as the first side). 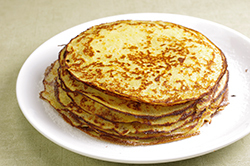 Transfer the crepe to the sugared plate, sprinkle it lightly with sugar, and continue with the rest of the batter. 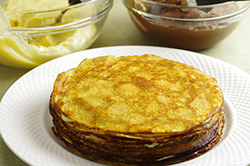 The crepes can be used now or held for later (see Storing). Think of pastry cream as pudding, and you’ll have an idea of its think and velvety texture. The fact that pastry cream is so very thick often surprises people, but its thickness is classic, and it’s what makes it perfect for its job: to be a filling for tarts, éclairs, cream puffs, or cakes. 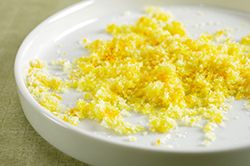 Bring the milk to a boil in a small saucepan or in a microwave oven. Meanwhile, in a medium heavy-bottomed saucepan, whisk the yolks together with the sugar and cornstarch until thick and well blended. 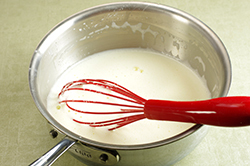 Whisking without stop, drizzle in about 1/4 cup of the hot milk – this will temper, or warm, the yolks – then, still whisking , add the remainder of the milk in a steady stream. Put the pan over medium heat and, whisking vigorously, constantly, and thoroughly (make sure to get into the edges of the pan), bring the mixture to a boil. 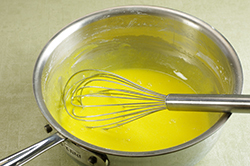 Keep at a boil – still whisking – for 1 to 2 minutes, then pull the pan from the heat. 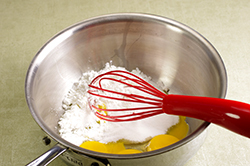 Whisk in the vanilla extract. 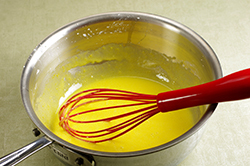 Let stand for 5 minutes, then whisk in the bits of butter, stirring until the butter is fully incorporated and the pastry cream is smooth and silky. Scrape the cream into a bowl. 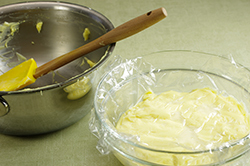 You can press a piece of plastic wrap against the surface of the custard to create an airtight seal and refrigerate the pastry cream until cold or, if you want to cool the custard quickly – as I always do – put the bowl with the pastry cream into a larger bowl filled with ice cubes and cold water and stir the pastry cream occasionally until it it thoroughly chilled, about 20 minutes. Bonne Idees: Because the recipe is so basic, it lends itself to variation. 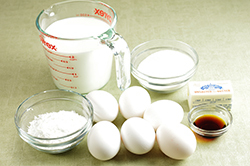 Rum-Scented Pastry Cream: When you add the vanilla extract, add 1 to 2 tablespoons dark rum, to taste. Liqueur-Scented Pastry Cream. 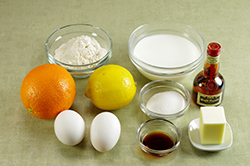 You can flavor the pastry cream with various liqueurs, such as amaretto, kirsch, or Grand Marnier. Reduce the vanilla extract to 1 teaspoon, and after you’ve added it, add 2 teaspoons liqueur. If you want more flavor (and you might), add more liqueur, 1 teaspoon at a time. Coffee or Espresso Pastry Cream. Make a coffee or espresso extract by dissolving 2 tablespoons instant coffee or espresso in 2 tablespoons boiling water. Add 1 tablespoon of the extract to the pastry cream after you’ve added the vanilla extract, then, if you want more flavor, add additional extract, 1 teaspoon at a time. 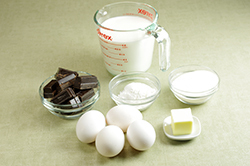 Like its sister, vanilla pastry cream, this chocolate cream can fill tarts, puffs, éclairs, or cakes. 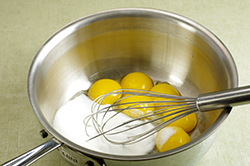 Meanwhile, in a medium heavy-bottomed saucepan, whisk the yolks together with the sugar, cornstarch, and salt until thick and well blended. 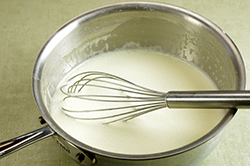 Whisking without stop, drizzle in about 1/4 cup of the hot milk – this will temper, or warm, the yolks – then, still whisking, add the remainder of the milk in a steady stream. Put the pan over medium heat and, whisking vigorously, constantly, and thoroughly (make sure to get into the edges of the pan), bring the mixture to a boil. 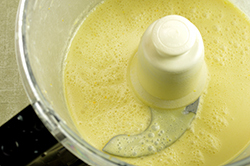 Keep at a boil – still whisking – for 1 to 2 minutes, then pull the pan from the heat. 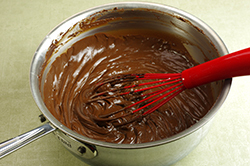 Whisk in the melted chocolate. 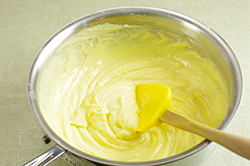 Let stand for 5 minutes, then whisk in the bits of butter, stirring until the butter is fully incorporated and the custard is smooth and silky. Scrape the cream into a bowl. You can press a piece of plastic wrap against the surface of the custard to create an airtight seal and refrigerate the custard until chilled or, if you want to cool the custard quickly – as I always do – put the bowl with the custard into a larger bowl filled with ice cubes and cold water and stir the custard occasionally until it is thoroughly chilled, about 20 minutes. Recipe adapted from Around My French Table by Dorie Greenspan. Copyright 2010. Published by Houghton Mifflin Harcourt, New York, NY. Reprinted with permission of the publisher. All rights reserved.